While telephone is still the king when it comes to support channels, it’s slowly but surely losing ground as the millennial generation flocks to text-based customer service. Chat support isn’t new to the party but continues to gain in popularity, touting the ability to handle multiple conversations at once and promising to drive your cost per contact down. This can be deceiving, however, because your average chat handle time is probably longer than an average phone call which making it dependent on the ability to handle multiple chats at once to justify it. 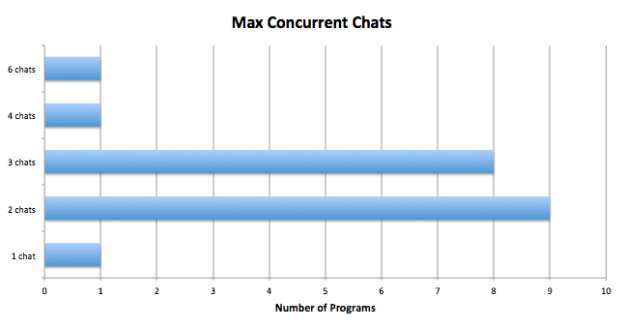 The overwhelming consensus is that most programs limit the number of concurrent chats to either two or three at a time which is about what I expected to see. I was a little surprised to see a couple outliers listed. The limit for the program that reported a limit of six is actually more like three but they can flex to six and call for backup if it gets busy. On a smaller customer service team where it’s difficult to pull extra people off the phones, this is not unheard of. I also surveyed our programs to get an idea of the subject matter that agents handle on chat, providing support, sales, and technical support as the options. I wanted to see if there was a correlation between the maximum number of concurrent chats and the difficulty of the subject matter. The results were inconclusive and the subject matter only really correlated with the type of support we already handle for the individual programs. If you are new to chat support, you may find that you need to adjust your maximum number of concurrent chats based on the complexity of the issues agents handle. Also consider cases where an issue requires agents to move the customer to another channel (i.e. calling the customer on the phone). Be sure to set clear guidelines around this, especially if agents have the ability to set their own maximum chat concurrency or decline chats in the chat tool. Depending on the size of your support operation and the volume on each support channel, you may have to be creative and will most certainly need to engage workforce management. 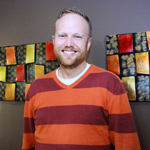 I recently outlined three different approaches to handling multiple support channels. Your options for staffing for chat are to dedicate a person or team of people to handle that channel, to rotate people who are dedicated to the channel at a given day or time, or simple make chat everyone’s responsibility to balance with other support channels. According to the survey results, only 25% of our programs had agents dedicated to doing just chat whereas the other 75% were cross trained to handle multiple support channels. The general consensus is that they’re not focusing on other channels while they are working on chats. If I were to dig a little deeper I’d likely find that many agents are expected to work on other text-based channels like email in between chats. Back to chat concurrency for a moment, one program reported that they attempt to handle one concurrent chat and one phone call at the same time but the volume is extremely low. The agents don’t have to answer the phone if the chat is really complex. That didn’t stop me from sharing a story about how I used to require my agents to handle a chat and phone call at the same time until I tried it myself. It’s really difficult to manage both and keep the stories straight. It’s only fitting when you talk about chat to broach the topic of dual monitors. In fact, here’s an article I wrote on the real purpose of dual monitors. While multiple monitors can distract from the task at hand if used incorrectly, they are essential for chat support. Agents need the ability to have their chats open on one screen and access their web browser and other tools on the other screen. It’s almost a given with chat support that they will have to navigate between windows so allowing them to have the necessary windows open all at once helps. When I asked all of our teams about dial monitors, the response was almost unanimous. All but one program have dual monitors standard for any agents that take chats. Offering chat support has some clear advantages and will continue, along with other text-based channels to eat into the telephone’s share of the market. As previously mentioned, keep in mind that one of the major selling points for chat is the ability to handle multiple customers at once. This benefit is diminished by not enough concurrency and/or a lack of efficiency. There’s a balance required when offering chat support but in general, agents should be able to handle 2-3 chats concurrently and dual monitors can help them do this effectively. 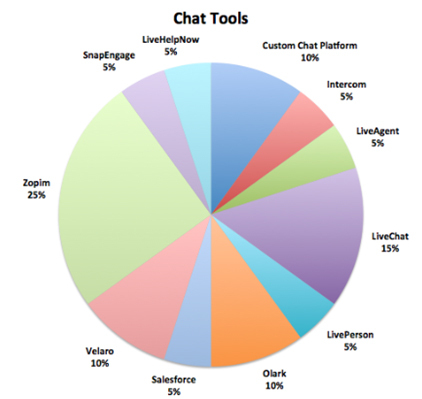 Finally, there are many great tools out there for chat and I highly recommend selecting one that fits nicely with your other tools. 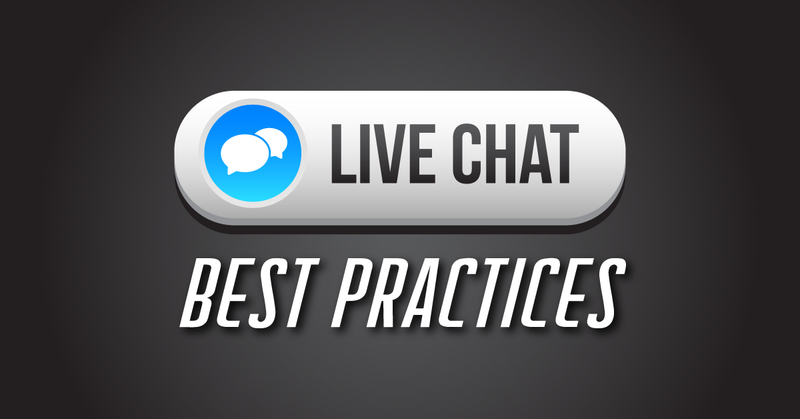 We’d love to hear how our best practices at FCR compare with yours when it comes to chat support. Leave us a comment or reach out to us on Facebook or Twitter.